About Russell Rescue, Inc - Russell Rescue, Inc.
Russell Rescue, Inc. (RRI) is a network of volunteers dedicated to placing unwanted or abandoned Jack Russells into permanent homes. RRI arranges for emergency rescues throughout the country, and gathers information designed to match appropriate permanent and temporary homes. It is funded by donations and supported by Jack Russell Terrier lovers and volunteers throughout the world. The majority of the dogs that end up in Rescue are unwanted simply for being Jack Russells by nature and behavior. Owners often find that they were unprepared for the care required for this high energy terrier; they did not understand the nature of the breed, and their instinctive desire to hunt. Owners are often gone all day, and therefore unable to provide the time, attention, and strenuous exercise this little dog requires. 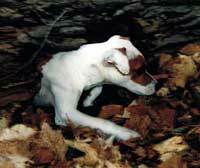 We would like to emphasize that Jack Russells need an active lifestyle, as they are hunting dogs by instinct. The goal of the Russell Rescue, Inc. is to have this unique hunting terrier be in the protective care of those who thoroughly understand this dog. This is a very unique dog that arrives in any life with a special set of needs not suited to everyone. They get into trouble. If they cannot find trouble, they create it. If bored, they can apply their extreme intelligence in destructive ways. They require an educated owner and a loving caretaker willing to provide what this dog needs to be happy and safe. Most of life with them involves protecting them from themselves and their own demise. They rarely lack courage and don’t take to abuse, even accidental abuse. Protects the Jack Russell Terrier by educating pet owners and breeders to the special needs of this breed to prevent displaced terriers. By offering advice and support to owners who wish to keep their pets, assisting them as to prevent the surrender of their Jack Russell Terrier. Provides for the temporary health and well being of Jack Russell Terriers given to the Russell Rescue, Inc by the owners who can no longer care for their dogs or Jack Russell Terriers housed in shelters, by offering temporary foster homes and/or referring educated adopters to the homeless Jack Russell Terriers in shelters. Places Jack Russell Terriers in suitable homes where they can live as the breed they are meant to be. Assists these terriers in finding homes where the quality of life will ensure a long safe healthy lifestyle for the terrier. Releases terriers who through no fault of their own from the pain and suffering of their lives in the most humane way when necessary. When unable to assist, RRI may be able to help refer you to other resources. The right environment is necessary for this astoundingly courageous companion. One needs to know they are the loaded gun of dogs. Before anyone should buy a Jack Russell, they would be wise to join the Jack Russell Terrier Club of America (JRTCA). After study it is advised to get a dog from those who are the guardians of the breed. We suggest to purchase a dog from JRTCA registered dogs who have passed the unique registry that is protective of this working terrier. It has been kept a working terrier by those who care about it’s future. Please study what has been written about the dog and it’s behavior. The behavior is hardwired into this dog. It makes it unsuitable to many situations. To know this may prevent dogs from needing Russell Rescue, Inc. Dogs purchased on impulse from a pet store or puppy mill is highly discouraged. People discard dogs without much thought. Russell Rescue, Inc. is first of all interested in helping the current owner of the dog understand behavior and needs of the dog in their care. If there is any way we can PRESERVE the home it is in, we serve to advise these current owners so they may keep their dog. If we can foster care a dog for someone in temporary difficulty and be able to reunite them, we are happy to help. We do not offer a quick fix. We are for the dogs who are lost or strayed or are in peril of destruction as discarded pets. Rescue dogs accepted for placement must be of sound character and have not bitten and/or shown aggression to a human. If you need to find a home for a terrier in your care, please first enlist the help and guidance of the breeder of your dog.